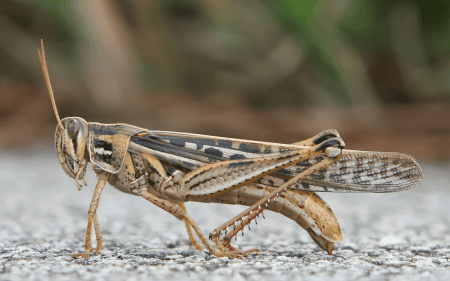 People associate locusts with plagues and massive agricultural farm damage while grasshoppers spur childhood memories of playing in the field and Jiminy Cricket. However, these critters are basically the same except for one major detail. 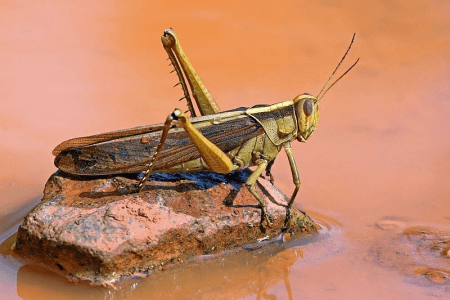 When is a locust not a grasshopper and vice versa? This article seeks to find out just that. A locust belongs to a certain species of short-horned grasshoppers that are members of the family Acrididae and are characterized by a behavior called a swarming phase. These insects undergo behavioral and physiological changes (i.e. phase polyphenism) upon reaching a high level of population density. This is what differentiates a locust from a grasshopper – locusts swarm under certain conditions. Locusts are harmless until they swarm. They are not a major threat to agriculture. However, in times of drought succeeded by fast vegetation growth, something happens to these innocuous insects. Serotonin in the locust’s brain starts a series of dramatic changes. They start to breed and grow exponentially. They become gregarious, forming a huge swarm of biblical proportions. Once the swarm is large enough, the locusts become nomads and somewhat migratory. The swarm moves around, stripping fields and causing damage to crops. Locusts travel great distances and consume green crops wherever their swarm settles. Grasshoppers belong to the order Orthoptera along with katydids (i.e. bush crickets) and crickets. Experts believe that grasshoppers are likely the oldest existing group of plant-chewing insects. Grasshoppers are believed to have been around for 250 million years, all the way back to the Triassic period. Their familiar, powerful hind legs allow them to escape from predators by catapulting themselves into the air with vigorous leaps. Grasshoppers do not go through a complete metamorphosis as they hatch from their eggs as nymphs or “hoppers.” They shed their skin (i.e. molting) several times as they grow into adults. Stridulation, or the distinct behavior in insects to rub their feet in order to produce a “singing” sound, forms a big portion of a male grasshopper’s daily routine. This is a way of communicating to others that it is healthy, sociable, and ready to mate. Female grasshoppers can stridulate as well, although the sound is nowhere near the male’s singing. Grasshoppers are typically polyphagous, which means they consume vegetation from different sources. They usually eat grasses, primarily including cereal crops. However, there are some omnivorous species that eat animal tissue and feces. So what’s the difference between a locust and a grasshopper? Locusts are members of the Acrididae family, a species of grasshoppers that have gone through behavioral and physiological changes. Grasshoppers, on the other hand, are insects that belong to the suborder Caelifera of the order Othoptera. They are considered one of the oldest plant-chewing insects and are not viewed as pests on their own. Locusts, in contrast, are considered pests that have been causing agricultural damage and famine throughout history.